Last spring, I reported that a family of black vultures had taken up residence in the loft above our garage. As usual, the little fellow turned out to be right, and we coexisted peacefully with the vultures throughout the summer. They even taught us a lesson about not judging a book by its cover (a lesson we learn over and over with Clay). When it appeared they had moved on for the winter, we still found ourselves watching for them on the roof when we came up the driveway or hung out in the backyard. Well, turns out the report of the vultures’ demise was premature. We spotted them on our roof several times throughout the mild winter. When some men came to check whether we needed a liner for one of our chimneys, the vultures landed on the other, giving the workmen a reason to do their laundry that week. This past Sunday morning, I was reading the newspaper at our kitchen table when movement outside caught my eye. 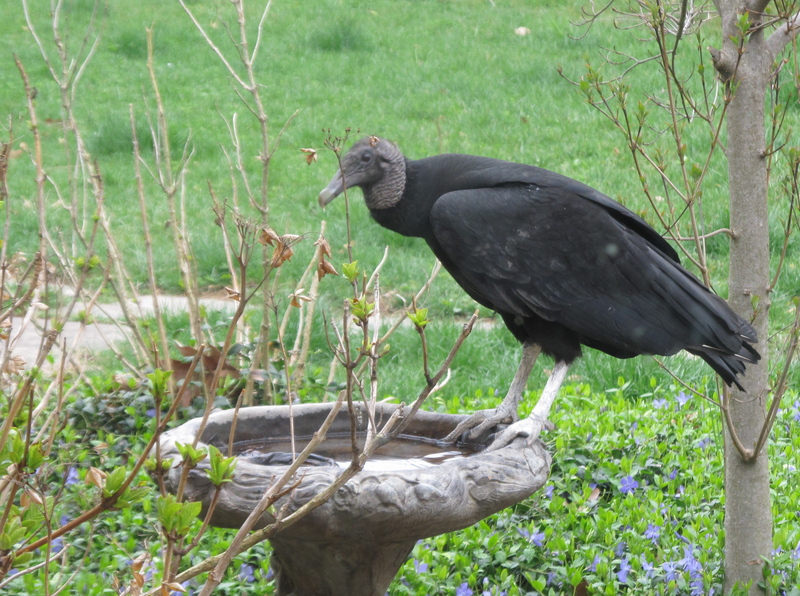 I looked up to see one of our buddies casually drinking from the birdbath (above). Spring is here, and our fine feathered friends seem ready to share another season with us. Maybe this year, there will even be babies. This entry was posted on April 4, 2012, 8:29 am and is filed under Communicating, Daily Life. You can follow any responses to this entry through RSS 2.0. You can leave a response, or trackback from your own site.